On Valentine’s Day, Linode announced their first specialized instance family: High-Memory instances, and lowest priced instance: $5 linodes, along with a slight storage upgrade for $10 linodes. Here is the details, first, let me show you what are High-Memory instances. High-memory instances are optimized for memory-intensive workloads like high-performance databases, in-memory caching, rendering and data processing. In other words, High-Memory instances come with more Memory, at least 16GB, which is $60 per month. $5 is an amazing price, you will find several VPS providers have instances at $5 per month, such as Vultr and DigitalOcean. 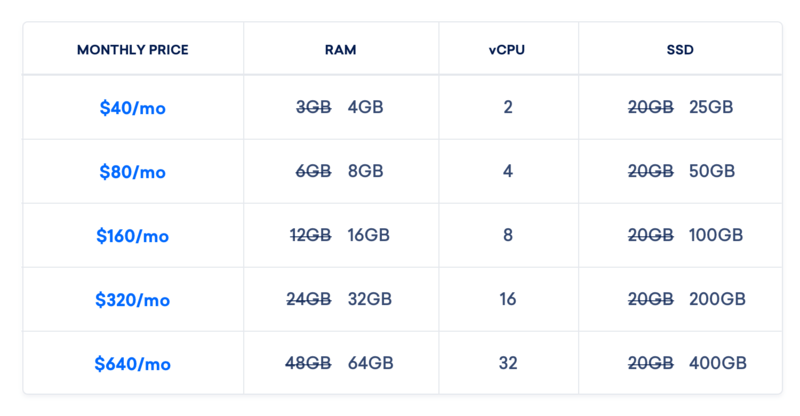 DigitalOcean’s $5 instance comes with 512MB of Memory and 20GB of SSD storage while Vultr’s $5 instance comes with 768MB of Memory and 15GB of SSD storage. Compared to them, Linode provides more resources, every $5 Linode instance comes with 1GB of Memory and 20GB of SSD storage. Every Linode instance’s network out speed has been upgraded to 1000mbps at least, High-Memory instances even up to 10000mbps. Besides, $10 Linodes received extra 6GB of SSD, now they come with 30GB of SSD storage. Linode upgrade their instances every year, the last upgrade was on their 13th birthday, June 16,2016. If you are finding stable and powerful instances, Linode worth a try.